Sorry for my lack of A Peek At My Week. I spent the MOST FABULOUS weekend with the girls in my family in Nashville this weekend. It was my birthday and we had so much fun. I love my little one, but this was my first trip (without husband) that I did not have her (and she is 4!). It was relaxing and wonderful! We didn't get back until late Sunday, so my peek didn't happen! We are full on Thanksgiving now. I love teaching Thanksgiving. When we began this unit, we did a KWL on Thanksgiving. As we discussed what we knew thought we knew about Thanksgiving...I was cracking up! They are so funny. Not a single student mentioned Pilgrims or Native Americans. That is exciting to me because I have a lot to teach them! As I was preparing for my literacy and math stations, I realized my Thanksgiving unit was not large enough for what I needed. I began literacy centers about this time last year, but this is my first year for math stations so I had nothing. I decided I needed to add more to my Thanksgiving unit and we are LOVING it!!! This unit included 9 Literacy and 9 Math Stations!!! Graphing - What's For Dinner? We are also getting a lot better at graphing! I cannot believe how fast this month is going!!! 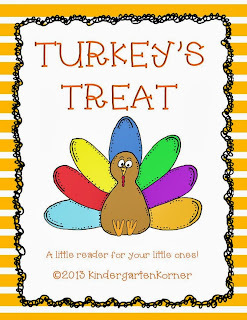 We will also be doing this Turkey Treat book (a freebie for you) that I created last year!